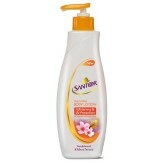 Amazon India selling Santoor Whitening and UV Protection Body Lotion for Women, 250ml Rs 99 only. to get free shipping or make cart value 499 OR Free Shipping for Prime Users. Activate your prime account.You can follow the below steps to buy this product at their deal price.Keep Visiting dealsheaven.in for more Best offers ,hot online deals, promo code, coupons and discount . It has Japanese Sakura flower extracts renowned for skin whitening and anti-ageing properties and Sandalwood extracts which help even your skin tone and texture. Its UV filter gives your skin daily protection from damaging rays on the outside to give you fairer, luminous and even-toned complexion. Let your youthful glow shine through with confidence! How to buy Santoor Whitening and UV Protection Body Lotion for Women, 250ml?